The large question for naval watchers and those with an interest in maritime matters is what is happening to the US navy. All powerful, seemingly all invincible, it has been humbled of late by a series of severe mishaps, some of the most severe since 1989, when the USS Iowa lost 47 sailors to a turret explosion. If it is a question of navigation and safety, things have been far from rosy. In June, the Philippine-flagged merchant vessel ACX Crystal collided with the USS Fitzgerald 50 miles southwest of Yokosuka, leading to the deaths of seven sailors. Cmdr. Bryce Benson and Cmdr Sean Babbitt, first and second-in-command respectively, were fired for having “lost trust and confidence in their ability to lead”. But nothing could get rid of that nagging feeling that something else was afoot, a deeper problem rooted in the navy. What beggars belief is that two entities of such size could possibly collide in the first place, even if the view from Haaretz is that such incidents “are bound to happen” in a world unqualified merchant ship crews and crowded waterways. With little else to make sense of, the naval report could only add some soothing balm to a terrible loss, noting those “swift, and in many cases, heroic actions” of the crew in saving lives. But the damage was done. The latest accident – on August 21 – was even more gruesome, seeing the loss of 10 sailors, and triggering the search and rescue teams of several countries, including Indonesia, Malaysia and Singapore. Remains have been found within the USS John S. McCain, which wound its wounded way back to Singapore’s Changi naval base after colliding with the Liberia-flagged tanker, the Alnic MC. The McCain’s portside had been given a frightful puncture, leading to flooding that found its way into crew compartments. The Alnic MC was more fortunate, sustaining damage near the front some 7 metres above the waterline. There were no reported injuries, nor was there a disastrous oil spill that would have compounded the entire fiasco. The John S. McCain, it would seem, did not stick to its designated traffic lane, pathways meticulously crafted by the Singapore authorities. The tanker, on the other hand, did. In dramatic fashion, and one distinctly more so for a superpower, a global “operational pause” was ordered by Chief of Naval Operations Admiral John Richardson for its startled fleet. A mighty force had been halted, to be subject to a general review of training and seamanship standards, with a more specific investigation of the Pacific theatre. 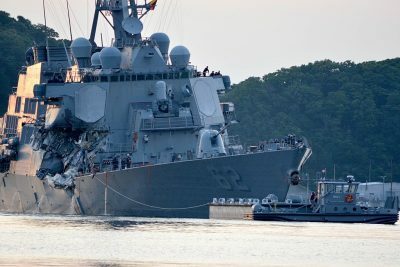 Such incidents – there have been four this year so far, including January’s run aground in Tokyo Bay of the poorly guided missile cruiser USS Antietam, and May’s collision between the cruiser USS Lake Champlain and a South Korean fishing boat – do much to feed Chinese assumptions that US prowess may be waning. The reasons vary, a sort of medley of entropic decline: exhaustion, constant deployment, thinly stretched operations after the attacks of September 11, 2001. Also telling is its logistical link: the recent chain of command has no line to patrol boats or destroyers. Bread and butter basics are being neglected. The way these basic points have been ignored by those in the Fox News camp is to suggest that the Chinese may well have been behind it – in the sense of an electronic attack. “A collision at sea can ruin your entire day”.